Dancing on the Clouds! 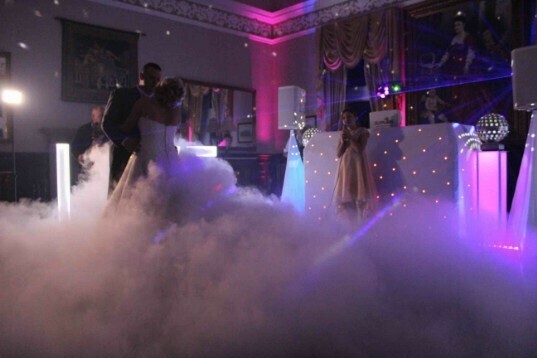 Dry Ice Machine Hire for your first dance. Huge wow factor for you and your guests. Exclusive to Craig Y Nos Castle clients, who book this package. Normally £300 for Standalone hire, but free of charge in this package. 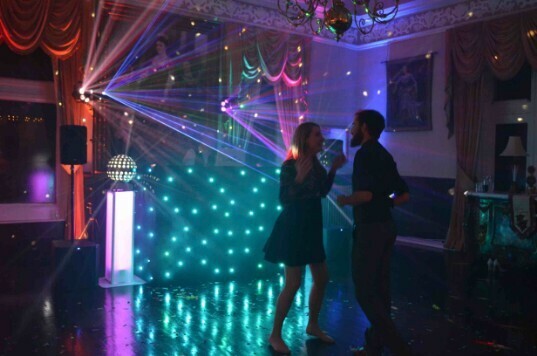 (A) Fridays & Saturdays: £35 per head (min 100) with venue hire on main function room & Bar (£1,050) - capacity 150.
or no venue hire when you guarantee 20 guests or more to stay overnight at weekend B&B rates. Guests will pay £150/night B&B for 2 in an en-suite, which drops to 50% of regular midweek B&B tariff (£70) for 2 on 2nd night if one of the two nights falls on a weekday (Sun to Thurs). NB: guests pay for their own accommodation. or no venue hire when you guarantee 20 guests or more to stay overnight at midweek B&B rates. Guests mid-week will pay £140/night B&B for 2 in an en-suite, which drops to 50% of regular midweek tariff B&B f£70) for 2 on 2nd night provided both nights are on a weekday Sunday to Thursday. NB: guests pay for their own accommodation). When taking SWEEP as a stand-alone Evening Only Reception, your booking is not 'Exclusive' as we may host another event in the Conservatory, plus there'll be other B&B guests using the lounges and Conservatory. There's no venue hire if you guarantee 20 guests to stay overnight. If fewer stay, then you simply make a top-up payment for the difference. For free exclusive use of the function room and bar, it's worth subsidising your guests' B&B, to encourage more to stay - and party - for longer. Venue hire at Regular tariff still applies to any extra rooms hired - however you shouldn't need extra rooms for an 'evening only' function. AGREEMENT made this day of the -------- by and between ? & Pure Wedding DJs, Hereinafter referred to as the purchaser/s, and Pure Wedding DJ's hereinafter sometimes referred to as the DJ. 1. The Purchaser hereby engages the DJ to provide a High Class DJ Service, All White RGB Pro Star Cloth Set Up, High Quality 4k Sound System, High Quality 3D Laser/Light Show, Mirror Ball Podiums, Dry Ice Dancing on Clouds for the First Dance, Confetti Cannon, Selfie Pod Photobooth (no printer) Uplighting, Party Photography, Video of the Party, 16gb Usb Stick, & backup equipment in case of failure. 2. The said DJ Service shall consist primarily of providing musical entertainment by means of a recorded music format. 3. Pure Wedding DJ's hereby agrees to render his professional services and is at all times to have complete control of his program except for the direction of the purchaser/s. Guests music requests will be played if they fit in with what you require on the night. Instant played next requests are only allowed to the Purchasers. Venue: Craig Y Nos Castle, Wales. 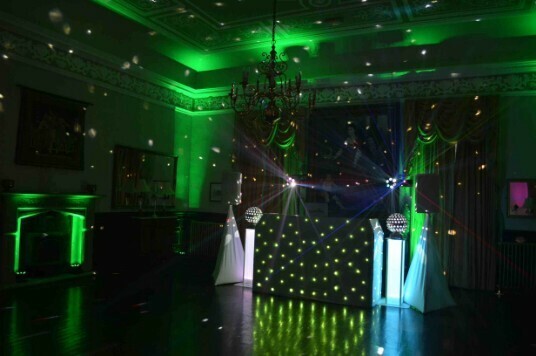 DJ – Steve Morgan (DJ PURE) Welsh Wedding DJ of the Year 2018 & Craig Y Nos Castles only preferred supplier. Please pay a non-refundable Deposit/Booking Fee of £200.00. Via Bank transfer to - Emily Morgan - HSBC – SORT CODE xxxxx – ACCOUNT NUMBER - xxxxxx - And leave your name as a reference. Please pay immediately to hold the date. We are a member of an online DJ agency; where people are able to book us instantly, so please don’t delay with the deposit as you may lose your booking with us. We are only able to put a hold on the date for 24hrs, and then release it if no payment is forthcoming. Please note, deposits/booking fees and full payments are non-refundable if you cancel before the event. This is due to the loss of other bookings. Please pay in full one month before your event. Dates may be changed if we are available, but will incur a minimum charge of £100 due to a loss of other bookings. We will require full payment if you cancel within three months of the event. We would prefer if you had wedding insurance in place to protect yourself, in case of any claims arising from damage caused by your guests to our equipment through drunken behaviour. This insurance also protects you in case of unscrupulous suppliers cancelling on you or going out of business. Plus it covers you if you need to cancel for some unforeseen reason. Dry Ice: This is a combination of water vapour and carbon dioxide gas. It’s very safe as long as you don’t lie on the floor for the full duration without access to the air above, as it has very little oxygen. We have used it very safely since 2015. However the machine uses scalding hot water which is dangerous and the ice is so cold it will burn to the touch, so we ask that you or your guests and especially their children, stay away from the DJ setup area whilst it is in use. There will always be a member of staff there whilst in use to prevent access. The effect lasts around 3-5 minutes so enough for most first dance songs. The effect can be dissipated by children running through it or by fast dancing, especially with a big dress, as it acts as a fan, so please be aware of that. Also venues with Air Condition can blow away the effect if it is directed at the dance floor. 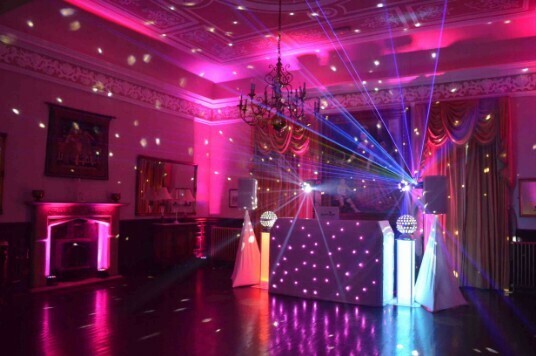 (1) You will enter into a direct contract with Pure Weddings DJ, not the Castle, for the Evening Disco he provides. (2) £600 is paid directly by you to the DJ in two instalments. 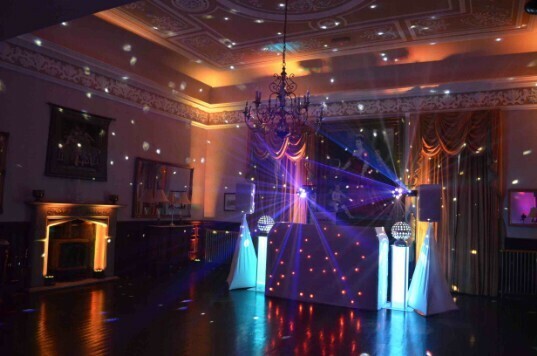 (3) To book the Pure Weddings DJ you will need to pay him a £200 deposit. Once he confirms payment to us, we mark your account as having paid £200 towards SWEEP. (4) The £400 remaining payment is due to the DJ 30 days prior to your Wedding. Once he confirms payment, we mark your account as having paid £400 towards SWEEP. (5) You pay the Castle for the balance of SWEEP. This means you never pay more than £25/ head on the SWEEP when taken as an add-on to the Wedding Breakfast (or more than £35 per head for SWEEP as a stand-alone), irrespective of your actual guest numbers. (6) You need 75 guests minimum for SWEEP as an 'add-on' and 100 guests for SWEEP as a 'stand-alone'. Videography of the Evening Party and Disco is included as a free extra service, with SWEEP, however it is not contractually guaranteed that the video will come out as you might want, or indeed, at all. We have only had once incidence of an SD card failing, but this can happen. We would suggest hiring a professional to video your whole wedding. (A) The service is not guaranteed. (B) We offer no assurance as to quality, focus, or angle of photos, however we have successfully videoed hundreds of first dances! (C) We do not edit or cut the resulting footage – we merely hand you the raw footage to do with as you please. If we use the video of your first dance or any guest dances, we will send you a link to the FIRST usage only, so you can inspect the footage and let us know if you disapprove. Notwithstanding para (E) above, should you disapprove for any reason we will remove the footage and not use it. We do ask for the reasonable co-operation of any primary photographer you may employ. You may decide that you do not need a photographer in the evening, as we will provide a free video service. However as this service is not guaranteed, as above, so you may prefer to employ a primary photographer for the evening as well as the day. Should a primary photographer be employed, it would be helpful if we can work together to get the best shots for you. Typically we for our part will not get in the way of a primary photographer. We will be standing in one corner of the room and shoot the video from this one corner, without moving around the room or making our presence felt. We ask that any photographer - or indeed any wedding supplier, caterer etc. - who will need to move around the room to get the best still-shots, stay as much as possible out of our videographer's sight-line. This is so we can obtain for you a clear image of your first Dance, as we do not offer an editing service to edit out obstructions later. In the unlikely event that the Videography service we offer is not able to be offered, due to sickness or unavoidable absence of the videographer, no compensation shall be due to you from Pure Wedding DJs, as this is a free extra service provided as a complimentary gift to you for using our DJ service, and as it is being not charged for, it is non-contractual. This consists of a one speaker sound system and DJ decks and wired shure microphone. I will play easy listening, folk, ambient, classical, soft rock, jazz, chill out, blues, etc, or anything you would like to add. I can also help with your grand entrance into the room with a special song, and announce it if the duty manager is unable to. We will need to finish this service at around 6.30pm to move the equipment for the evening disco if it’s in another room. The agreement of the DJ to perform is subject to proven detention by road traffic accidents, riots, strikes, floods, snow, road closures, epidemics, acts of God, or any other legitimate conditions beyond their control. If such circumstances arise, all reasonable efforts will be made By Pure Wedding DJ's to find replacement entertainment at the agreed upon fees. If you would like to have a later finish time, this must be agreed and paid for a week before the wedding, if we are free to do so. For all day weddings, this will not be possible, as we will have started at 9am in the morning. This is charged at £100 per hour. It is understood that if this is a "Rain or Shine" event, Pure Wedding DJ's compensation is in no way affected by inclement weather. For outdoor performances, the purchaser shall provide overhead shelter for setup area. The DJ reserves the right, in good faith, to stop or cancel the performance should the weather pose a potential danger to him, the equipment, or audience. Every effort will be made to continue the performance. However, safety is paramount in all decisions. The DJ's compensation will not be affected by such cancellation. In the event of circumstances deemed to present a threat or implied threat of injury or harm to Pure Wedding DJ's staff or any equipment in Pure Wedding DJ's possession, Pure Wedding DJ's reserves the right to cease the performance. 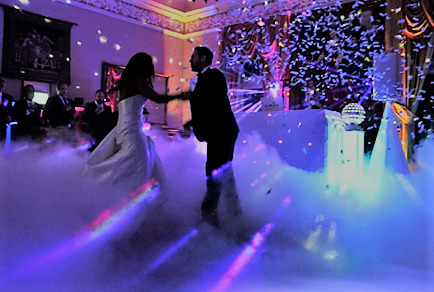 If the Purchaser is able to resolve the threatening situation in a reasonable amount of time (maximum of 15 minutes) Pure Wedding DJ's may resume performance in accordance with the original terms of this agreement. In order to prevent equipment damage or liability arising from accidental injury to any individual attending this performance, Pure Wedding DJ's reserves the right to deny any guest access to the sound system, music recordings, or other equipment. If actual physical assault is committed against any staff member we will cease our performance. 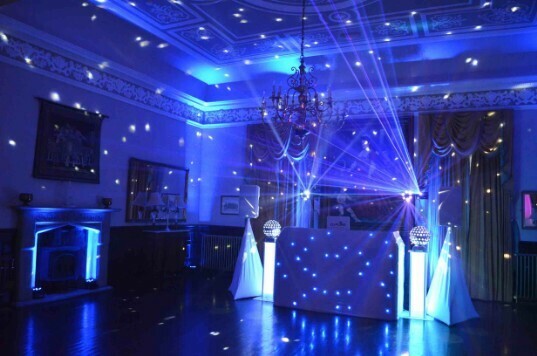 The purchaser shall provide Pure Wedding DJ's with safe, flat, dry and appropriate working conditions. This includes a 12 ft wide x 7 ft deep area for setup, to fit a 6ft wide DJ Booth, speakers and lighting stands, which are 8ft high. Pure Wedding DJ's requires a minimum of two 240v electrical circuit outlets from a reliable power source within 20 feet (along the wall) of the set-up area. This circuit must be free of all other connected loads. Any delay in the performance or damage to the DJ's equipment due to improper power is the responsibility of the venue. Two circuits are preferred, where possible. The Purchaser shall provide crowd control if warranted. 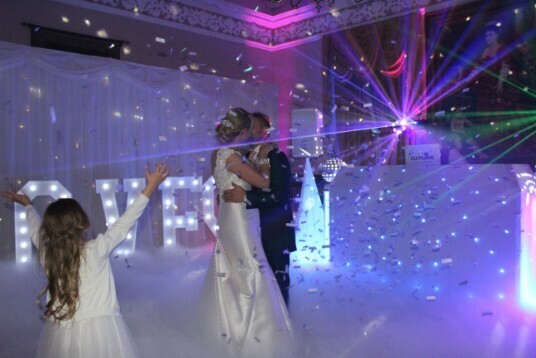 We will need extra sockets if you require the dry ice service, or uplighting. If you have hired a Marquee or Tipi, please ensure the electricity supply is adequate. (Usually a heavy duty generator will be required) Please speak to the hire company about this important matter, as using electric from a domestic house will not be sufficient if there are many services plugged into it. A written event/music planner or music request list (word or text file) must be received from the Purchaser and forwarded to Pure Wedding DJ's at least one month prior to the date of the engagement for it to be included in Pure Wedding DJ's programming guidelines. Please keep it to a maximum of 30 songs. With or without the aid of an event/music planner or music request list, Pure Wedding DJ's shall attempt to play Purchaser's and Purchaser's guests music requests, but shall not be held responsible if certain selections are unavailable. Please make sure you state the correct artist’s name, song title and relevant remixes in the play list. Please make us aware if certain songs or styles are forbidden, and if guests requests are allowed. I would like to point out the best way to get the most from myself as a DJ, is to let me read the room, and play what the majority like. My main aim is to keep the majority dancing. So just giving me a list of genres, and a small list of must plays, this will hopefully ensure a great party. Please note, I try not to play cheesy overplayed songs, only if you are happy with them being played, and if other genres are not working. Some other tips for keeping the dance floor full are having the temperature as low as possible. So Air Con, Fans, or air circulation by having windows and doors open really helps in the summertime. Also cool clothes and soft footwear is a great help. This agreement guarantees that Pure Wedding DJ's will be ready to perform at the start time of the engagement. No guarantee is made as to Pure Wedding DJ's time of arrival; however, Pure Wedding DJ's request’s that they be permitted at least 1 hour for the small package, and 2 hours for the larger packages, before the engagement and 1 hour after the engagement for load in, setup, takedown & load out. We do not stay on for free to make up for lost time if your day overruns. Mr & Mrs Game – Yes/No? 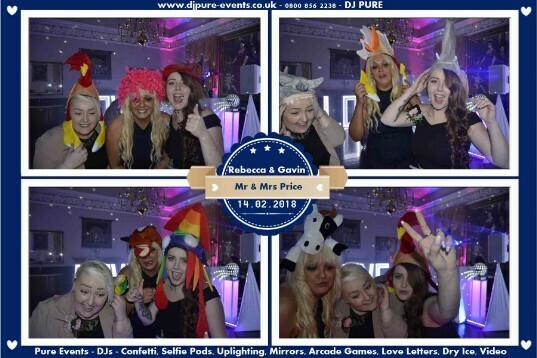 Pure Wedding DJs two staff rider – Please provide a vendors meal for all day services, and access to clean water, and in the evening access to the buffet if available. Please let us know if you refuse this hospitality, so we can try and make arrangements to bring our own food. Pure Wedding DJ's holds £10,000,000 Public Liability Insurance and a Portable Appliance Test Certificate (PAT) for all equipment. By executing this contract as the purchaser, the person executing said contract, either individually, or as an agent or representative, represents and warrants that he or she is eighteen (18) years of age, and further, if executing said contract as agent or representative, that he or she has the authority to enter into this agreement and should he or she not have such authority, he or she personally accepts and assumes full responsibility and liability under the terms of this contract. The laws of the United Kingdom shall govern this agreement. The purchaser may not transfer this contract to another party without the prior written consent of Pure Wedding DJ's. This agreement is not binding until signed by both the purchaser and when Pure Wedding DJ's has received it. 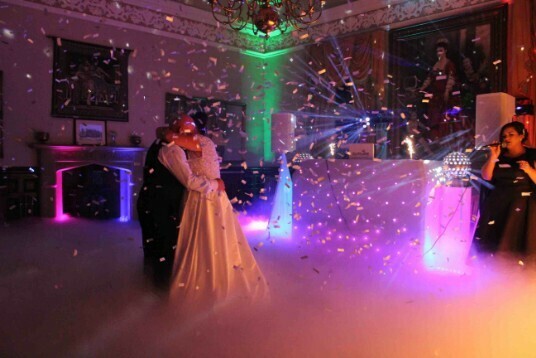 Any changes must be written and signed by both the purchaser and Pure Wedding DJ's. Oral agreements are non-binding. If any clause in this agreement is found to be illegal, the rest of the agreement shall remain in force. Pure Wedding DJ's may elect not to exercise their rights as specified in this agreement. By doing so, Pure Wedding DJ's does not waive their right to exercise those options at a future date. Please return the contract within 7 days. Please note, if no advance payment/booking fee has been paid, this contract will be non-binding. We will endeavour to keep the date free for yourself but once we have confirmed via telephone of your intention to book us, please could you pay as soon as possible. We will hold the date for a maximum of 24hrs then release it, if no payment is forthcoming. Complaint procedure - In the unlikely event that you should feel dissatisfied with any aspect of our services, please bring it to our attention on the day or night, so that we can work out a way to rectify the matter. If in hindsight you feel dissatisfied, please call us with your issue. Craig Y Nos Castles only preferred DJ Company. Dates shaded are unavailable for booking, all others can be booked with the SWEEP package. Pink = External bookings, Blue = Castle bookings. If the date you require is unavailable above, with provider Pure Weddings DJ, we have an alternative provider who offers a similar service for £50 extra. See the DEEP package via alternative DJ provider. DEEP provides the Evening Entertainment added to the Buffet Package, known as SWEEP (Special Wedding Evening Entertainment Package) but you will need to pay £50 extra. In both cases you pay and contract with the relevant DJ direct.